Emilienne Morin was born at Angers on France on the 28th October 1901. She was the daughter of anarchist militant Etienne Morin. He was a militant building worker who had sheltered several draft dodgers and deserters during the First World War. He appears to have moved to Paris in the 1910s with his family and was active in a group of the Federation Communiste Anarchiste. Emilienne was active from an early age in revolutionary circles. In 1916 she was the secretary to the anti-war paper Ce Quil Il Faut Dire (CQFD- What Needs to Be Said) edited by the anarchists Sebastien Faure and Mauricius. She was also active in the Syndicalist Youth group of the 15th arrondissement and from 1923 was active as a member of its secretariat. In 1924 she married the Italian anarchist militant Mario Cascari (alias Cesario Tafani alias Oscar Barodi). They were divorced three years later. 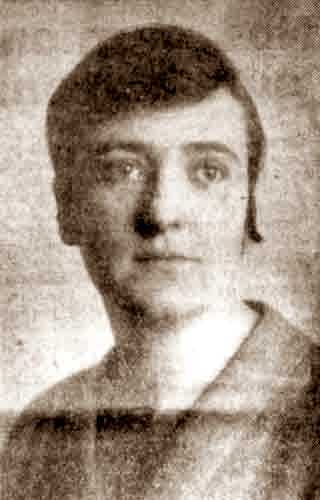 Emilienne was active with the Freedom for Sacco and Vanzetti run by the Union Anarchiste Communiste (UAC) and then the Durruti-Ascaso-Jover Support Committee also set up by the UAC to defend the three Spanish anarchists imprisoned by the French state. On 14th July 1927 she met the Spanish anarchist Buenaventura Durruti at the International Anarchist Bookshop at 72 Rue Des Prairies in the 20th arrondissement of Paris. Her friend and comrade Berthe Fabert (often wrongly given as Faber or Favert) ran the bookshop with her then-partner Severin Ferandel and she met Durruti’s close associate Francisco Ascaso there on the same day (when Ferandel left for Mexico in 1929 she formed a relationship with Ascaso). As Emilienne was to reminisce: "Durruti and I never married, of course, what do you figure?" Anarchists do not go to the civil registry, we met in Paris, he had just gotten out of jail….He was released, Durruti went out that same afternoon, visited some friends, I was there, we saw each other, we fell in love with each other and we continued ". Life was difficult for the couple in Brussels. In 1931 they moved to Spain. Emilienne continued her militant activity and was active writing for the CNT press and taking part in meetings and demonstrations. On 4th December she gave birth to a daughter, Colette, in Barcelona. She had to raise her daughter almost singlehanded as Durruti was almost always in hiding or in prison in this period. Comrades obtained a job for her working at the Goya theatre whilst the Barcelona anarchist Teresa Margalef looked after Colette. With the outbreak of the Spanish Revolution and Civil War Emilienne joined the Durruti Column on the Aragon Front and worked as secretary at its HQ where she was in charge of its press department. She acquired the nickname of “Mimi-FAI” whilst with the Column. When the Column moved to Madrid she returned to Barcelona to look after her daughter. After the death of Durruti she worked for a while with the Council of Defence and then returned to France to take part in solidarity campaigns for the Spanish anarchists, writing articles and addressing meetings. She was one of the speakers at the meeting in support of the Spanish anarchists attended by 4,000 people and convened by the Union Anarchiste (UA) on the 27th May 1937 in Paris. She became active in Solidarité Internationale Antifasciste (SIA) set up by the anarchists Nicolas Faucier and Louis Lecoin, which campaigned in support of Spanish anarchism. She also wrote for Le Libertaire, the paper of the UA, contributing articles on the Spanish situation including her account of life with the Durruti Column. On 22nd November 1938 she spoke at the mass meeting in Paris organised by the UA to commemorate Durruti. With the Occupation she had to go underground, still involved in solidarity with the Spanish anarchists under difficult circumstances. She continued this activity after the war and up to her death on 14th February 1991 at Quimper in Brittany.